PRINT VALUE - Dématérialisation de documents, location et réparation de copieurs. GOL and equipment rental, maintenance, repair…Discover our services for SMEs and ETI! Discover GOL! Cut through your red tape, e-mail your invoices, automate your accounting, automatically organise your documents, etc. Let us help you choose your copier! Short or long-term rental, delivery, installation, training and maintenance. Have your printers repaired and serviced within 24h/48 hours. Free estimate on the hotline, repairs guaranteed for 6 months. Implement a printing policy in my company. Boost your equipment’s productivity, save money and secure your documents and data. 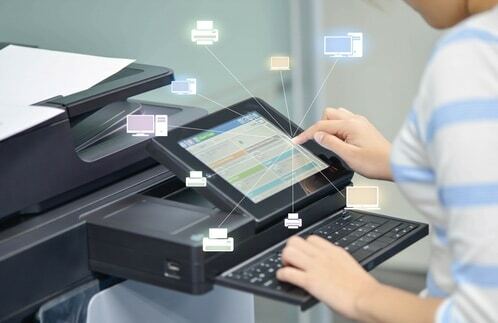 Print Value specialises in paperless and document printing solutions in companies. Creating, printing, going paperless, storing and shredding. Print Value considers your documents as a whole. We streamline your workflow processes to significantly cut your costs and boost productivity while integrating the security and mobility crucial to your company’s digital transformation. Multifunctional printers, copiers, plotters. Trust us with your printing equipment. Repetitive breakdowns, jams, streaks, connection problems, etc. Cut your costs, secure your printouts, boost your equipment’s productivity. Aware of companies’ present needs, we guarantee our customers quick, clear, precise responses. We send our estimates within 1 hour and make appointments within 24 hours. Our team of managers, sales representatives and technicians, all experts in their fields, is available to serve you with the utmost care. For 10 years, Print Value has strengthened its expertise to give its customers service that always meets their needs. We offer them high-quality service to guarantee their satisfaction. Clear, precise proposals, all-inclusive prices, a frank exchange with your interlocutor.